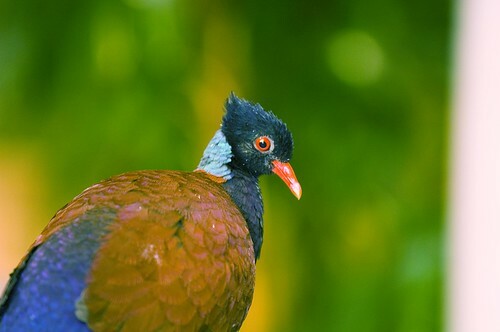 A brightly colored species, the pheasant pigeon has a brown back and wings, blue chest, green head, iridescent green-blue neck ring, and red rings around the pupils. Common. 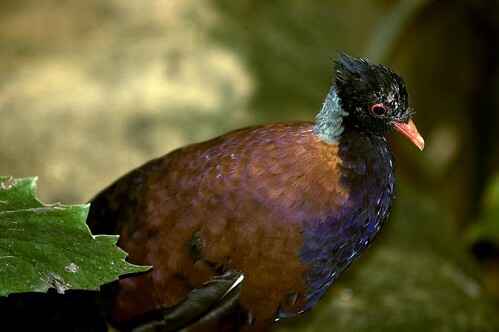 Lincoln Park Zoo participates in the Green-Naped Pheasant Pigeon Species Survival Plan®, a shared conservation effort by zoos throughout the Association of Zoos and Aquariums. 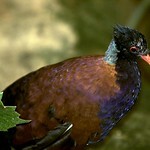 The species gets its name from its pheasant-like behavior: it lives on the rain forest floor, feeding on fallen seeds and fruits. 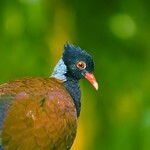 Green-naped pheasant pigeons lay one egg at a time in nests built beneath bushes and trees.